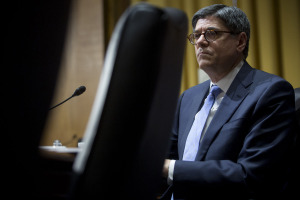 U.S. Treasury Secretary Jacob J. Lew warned global policy makers against devaluing exchange rates for competitive advantage amid mounting concern over the strength of the dollar and slowing world growth. The comment, made at the annual meeting of the International Monetary Fund in Washington, served as a reminder of the 2013 pact between finance chiefs not to use currencies as a policy tool for fear of triggering a spiral of devaluations and trade wars. Lew’s comments come after the dollar gained 6.7 percent against 10 major currencies since the end of June, drawing a warning from the Federal Reserve this week that further gains could impede economic expansion. While they deny targeting cheaper exchange rates, the Bank of Japan and European Central Bank have indicated comfort with slides in the yen and the euro as they try to bolster inflation. ECB Chief Economist Peter Praet said in Washington yesterday that a weaker euro along with lower food and energy prices is “not a bad combination.” Vice President Vitor Constancio said the central bank’s recent steps to boost its balance sheet should have “rippling effects” through foreign-exchange markets. ECB President Mario Draghi today denied that the central bank has “actually undertaken policies directly targeted to the exchange rate” and that the euro’s recent fall reflects divergence in international monetary policy. The euro area is not alone in eyeing currencies as a support for their economies. Bank of Japan Governor Haruhiko Kuroda said a weak yen is positive as long as it reflects economic fundamentals because it supports exports and manufacturers’ profits. “The impact of weak yen varies depending on an economic sector but as long as a weak yen is reflecting economic fundamentals, it brings positive impacts on the economy overall,” Kuroda said late yesterday. Meantime, the central banks of Switzerland and the Czech Republic have placed caps on their exchange rates. Authorities in Australia and New Zealand also have sounded disquiet with strength in their currencies. A falling currency traditionally provides a boost to exports and also import prices, providing a source of growth and inflation for economies as the global expansion slows and central banks run short of monetary ammunition. By contrast, a rising currency can crimp economic growth. China was the only economy singled out by Lew for criticism as he again urged the world’s second-largest economy to let the market set the value of the yuan. “It is critical that Chinese leaders implement reforms that move the country toward a market-determined exchange rate and address financial-sector risks,” Lew said. Responding to Lew, central bank deputy Yi Gang said China is constantly working toward the goal of a market-based yuan, and that it has reduced the amount of interventions to almost zero. “Some homework” remains for China to do to promote its currency globally, including making the yuan freely convertible in a gradual manner, and furthering efforts to “respect market demand and supply and maintain financial stability,” PBOC Governor Zhou Xiaochuan told Bloomberg today. While the dollar has gained amid signs the U.S. economy is finding the upward momentum lacking elsewhere, economists warn currency strength could end up slowing growth. Some Fed officials last month worried that a further appreciation of the dollar could “have adverse effects on the U.S. external sector,” according to the minutes of their meeting. A report issued by Barclays Plc economists estimated that a 10 percent climb in the trade-weighted value of the dollar knocks 0.4 percentage points off inflation and economic expansion over a year. “U.S. growth is at risk from the appreciation in the dollar,” Willem Buiter, chief economist at Citigroup Inc. and a former U.K. policy maker, said at a banking conference yesterday in Washington.